Steven Jesse Mazzio, our primary Appraiser, has been a dealer in antiques since 1962.He is a Member of the Appraisers Association of America and a Senior Member of the National Association of Professional Appraisers, and has provided Appraisal services to the public and professionals for more than16 years. Generalist Appraisal firms rely on broad knowledge of the property that is typically found in clients homes. Antique and modern furnishings, silver, jewelry, chinaware, paintings and prints, Asian wares, numerous categories of collectibles and special collections including books, coins, clocks, firearms and Native American artifacts are routinely examined and valued. A practical approach to Valuation, based in decades of experience in the retail and wholesale trades, generates useful and accurate conclusions. 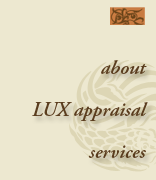 Lux Appraisers provides services by appointment on-site or at our offices.We evaluate individual items of worth or entire Estates and collections. As well, we offer on-line appraisals for select property. All Appraisals conform to the Uniform Standards of the Professional Appraisal Practice.They are objective and are kept confidential. We maintain a substantial reference library and subscribe to on-line information services and sales results databases. This access facilitates efficient and accurate research. Our firm distinguishes itself in its flexibility, responsiveness and comprehensive services. We pride ourselves on prompt delivery time of necessary documents. A fast track service for clients needing immediate attention is available at no additional charge. Fees are on an hourly or per diem basis, and are based on time spent on examination, research and document preparation.